There are so many things to do in the Midlands of England that its remarkable the region is so often overlooked by visitors. They rush from the cosmopolitan South over motorways across to the North without stopping to discover the region that gave birth to Shakespeare, the Industrial Revolution and the greatest hoard of Anglo-Saxon gold and silver metalwork ever found. Enjoy our grab bag of things to do in the Heart of England, from hiking in the Peak District to visiting some of England's grandest historic homes and gardens to crossing the world's first Iron Bridge or going cross country on a vintage steam railway. At the World of Wedgwood, a terrific museum, shopping and china factory in Stoke-on-Trent, you can see centuries of amazing pottery — including original pots made in Josiah Wedgwood's 18th century factory and even older local wares. The collection, on permanent loan from London's Victoria and Albert Museum, is truly world class. While there, you can tour the factory to see how the finest pots and tableware are thrown and decorated; shop for breathtakingly expensive china; have a posh tea — on Wedgwood china, naturally — or a light lunch in the former workers' canteen, now a sunny, casual restaurant. Best of all, you can throw your own pot on a wheel — with lots of staff help — and organize to have it fired and sent to you as a finished piece. The British public voted the Iron Bridge, a graceful single arch span 60 feet above the river Severn, an English icon in 2006. The world's first cast iron, arched bridge has given its name to the village, to the gorge and to the UNESCO World Heritage site that surrounds it. Hard as it is to imagine in this quiet, bucolic place, Ironbridge Gorge was one of the earliest centers of industry in the world and the place where the seeds of the Industrial Revolution were sown. Today you can visit ten different museums, all within a mile or two of each other. At the Coalport China Museum, step inside a huge beehive kiln to see how the earliest fine bone china was made. At the Coalbrookdale Museum of Iron you can explore the remains of one of the world's oldest iron furnaces, where metal was first smelted on an industrial scale. At Blists Hill Victorian Town, stroll in and out of the houses, shops and workplaces of this early village.You can spend a family weekend exploring it and then take a tranquil kayak trip on the river that powered it all. The Midlands has several vintage railways adored by rail and steam enthusiasts from all over the world. They are usually restored and maintained by volunteer enthusiasts and experts who are delighted to tell you all about them. You can ride the rails along quiet backwaters and disused tracks or dress up as an Edwardian to enjoy a cream tea in vintage surroundings while being gently hauled cross country behind a steam locomotive. The Severn Valley Railway is one of the most ambitious, and among the oldest with a history dating back to the Victorian era. There 5 scheduled stops along its 16 miles of track between Bridgnorth in Shropshire and Kidderminster in Worcester as well as request stops in the Severn Valley Country Park and at Northwood. The Telford Steam Railway is actually older than the age of steam. Horses once pulled cars along its rails to deliver raw materials and coal to the industries in Iron Bridge Gorge. The largest freestanding Roman wall in Britain gives a sense of the size of a bathhouse in Viriconium (now Wroxeter Roman City), the fourth largest Roman city in Britain. Explore the reconstructed Roman villa, beside the Roman road and based on nearby excavations. The living spaces, furniture and murals will give you a good idea of the life of an average Romanized British family toward the end of Roman occupation in Britain. Unlike the many Roman military installations and religious sites scattered around England, Wroxeter, near Shrewsbury and the Welsh border, was an ordinary middle class town, rather than a garrison, with markets, entertainments and ordinary people. The little museum at the site is fascinating. Not far from Wroxeter, Attingham Park is a house with fascinating stories to tell. Alternately lavished with attention and shamefully neglected by its owners, the house was restored to its 18th century, Georgian glory by the National Trust in the 21st century. Every room tells its own entertaining tales. Take the one about the frugal parson, a younger brother of a younger brother who never expected to inherit the house but did. He was so overwhelmed that he spent the rest of his life throwing off his spartan ways and drinking the cellar dry. There's also a scenic breed of rare and heritage cattle, extensive park land and an ancient oak planted by landscape architecture star Humphrey Repton. In 2009, a man with a metal detector made the find of a lifetime, uncovering 3,500 pieces of gold and silver metalwork, enamel and semi-precious stones. The Staffordshire Hoard as it came to be known, is the largest hoard of Anglo Saxon treasure ever discovered. In the battle to keep and display it, that mega-institution, the British Museum, lost out to two Midlands museums, the Birmingham Museum and Art Gallery (BMAG), and the Potteries Museum in Stoke-on-Trent. Now you can see the gold near where it was found in the Midlands. And, if you think you might have a go with a metal detector yourself, find out what the rules of Treasure and Treasure Trove are in the UK. While you're at BMAG, don't miss the world's most important collection of Pre-Raphaelite art with paintings by Dante Gabriel Rossetti, John Everett Millais, William Holman Hunt and others of the 19th century Pre-Raphaelite Brotherhood. The museum is in the center of Birmingham and is free to visit. Indian brides from all over the UK and Europe head to Birmingham to buy sari fabrics and wedding accessories in The Rag Market, the oldest of Birmingham's Bullring markets with 350 stalls selling wares of all kinds. The Bullring markets are just a small part of the retail heaven that is the UK's second largest city. Virtually the whole of the city center is covered with several huge, multi-level modern malls. A short walk away, The Mailbox, so called because it was once a Post Office headquarters designed to look like a typical British mailbox, is a center for luxury fashion. And a few miles away, in the Jewellery Quarter, you can have gems and precious metals custom designed or catch the work of up and coming jewelry designer-makers at more than 100 jewelry shops and 400 jewelry related businesses. Around 40 percent of the jewelry sold in Britain — including some sold by the most prestigious Bond Street shops — is actually made in the Birmingham Jewellery Quarter. The market town of Stratford-upon-Avon is a must-visit locale for lovers of the bard. See a play at the acclaimed Royal Shakespeare Theatre (highly recommended). Tour all the Shakespeare family houses. Or simply wander the streets and along the banks of the Avon, admiring the beautiful, medieval half-timbered houses. Take a lunchtime cruise to see it all from a different perspective. And don't forget to travel a few miles out of town (there's a convenient, hop-on, hop-off bus) to Anne Hathaway's cottage — the scene of the real life Shakespeare in love. When you hike, cycle or motor tour in the Peak District, you are stepping into real social history. The Park is the oldest national park in the UK — though it was only founded in the 1950s. But an event there in the 1930s led to the opening up of most of England's privately owned land to walkers and the foundation of the National Park movement in the UK. In 1932, 500 people walked from the city of Manchester to the highest point in the Peaks, a plateau called Kinder Scout. It became known as the Kinder Scout Mass Trespass and was one of the most successful acts of civil disobedience in UK history. It ultimately led to the National Parks act in 1949, the establishment of Britain's network of long distance paths and the countryside rights of access enshrined in British law. History lesson over. Peak District National Park is a beautiful place to visit for fans of the great outdoors. Chatsworth on the edge of the Derbyshire Peak District is one of the most popular homes for U.S. visitors. It has been in the Cavendish family, the current Dukes of Devonshire, for more than 450 years. Among the family's wealth of colorful characters was the scandalous Georgiana Spencer, ancestress of Princess Diana and subject of the film The Duchess, starring Kiera Knightley. This is one stately home where the contents outshine the 1,000-acre Capability Brown-landscaped park, the gardens and the waterworks — created to thrill a Russian Tzar (who never saw it). The family's passion for art collecting across five centuries has resulted in one of Europe's finest private art collections. More than 4,000 years worth of art is represented — from classical sculptures to contemporary works — all held in trust for the public to see. Tickets to tour the house, garden, Farmyard & playground or any combination of the four cost between £6.50-£23. Silverstone, the home of the British Formula 1 Grand Prix, is just one of the surprising things you'll find in the county of Northhamptonshire, also called the "Heart of England." While there, you can accompany a driver on a hair raising ride around the track at speed. Or you can spend the day learning how to drive a Formula 1 car to take on the track yourself. Althorp, Diana's childhood home and final resting place, is open to the public during fixed periods every year. The dates are announced on the Althorp website. The house has been the home of the Spencer family for 500 years and its collections are fascinating. There are 650 portraits, perhaps the finest portrait collection in Europe, including a room full of family portraits by Sir Joshua Reynolds, who was a family friend. There's also a long gallery of portraits of the ladies of King Charles II's court, all said to be his mistresses, painted by Lely. The house has the only known portrait from life of the ill-fated Lady Jane Grey, queen of England for about 9 days before being beheaded by Mary Tudor, aka Bloody Mary. If you visit Northamptonshire in May, make time to stop at Coton Manor, for its lovely English bluebell wood. The garden, created privately by one determined homeowner and his gardener, is a lovely place to stop for a stroll, have a cream tea and admire the very English springtime sight of a carpet of blooming bluebells covering the floor of a five-acre woodland. Richard III, the most villainous king in all of Shakespeare's plays, may not have been such a villain after all. And he may not have been responsible for murdering his nephews — the two little princes — in the Tower of London, in order to secure the throne. The jury's still out on all that. But what is proven is that the skeletal remains found dumped unceremoniously in an unmarked grave under a municipal parking lot in Leicester are those of the hunchbacked king. The new, award-winning Richard III Visitor Center, Richard III: Dynasty, Death and Discovery, tells the story of his life and times, the dynastic Wars of the Roses and the amazing detective story and modern genetic investigation that led to the discovery and identification of the king's body. After visiting the center, explore Leicester Cathedral, where Richard is now buried, and take in the nearby Bosworth Battlefield Heritage Center to see where he met his end, crying out — if you believe Shakespeare — "A horse, a horse. My kingdom for a horse." Lincoln, in the East Midlands, has a very well preserved Medieval Quarter as well as some interesting Roman remains. It's at the very top of the town and the cobbled pedestrian street that leads to it is so steep it is actually, officially called Steep Hill. In fact, most of the street is lined with railings to help pedestrians cling on and get to the top. Don't worry though — if you want to make your way from Lincoln's retail district and waterfront on the River Witham without hiking up Steep Hill, there is a bus. There are plenty of good reasons to visit the area known as Lincoln Uphill. The Cathedral, one of the earliest examples of the English style known as Perpendicular Gothic, was, until the mid 16th century, the only man made structure in the world taller than the Pyramids. While at the Cathedral, look for the Lincoln Imp — legend has it he was frozen in stone by an angel— and The Green Man, a carving that harks back to pagan symbolism. After you visit the Cathedral, find your way down through the Cathedral Quarter to the ruins of the Medieval Bishop's Palace. It's reputed to be haunted and is definitely spooky to visit after dark. Lincoln Castle has occupied the highest point in the city for almost 1,000 years — possibly longer. It has been a place of judgement and imprisonment for most of that time and remains the site of Lincoln's Crown Court. The Magna Carta Vault: In 1215, the barons forced King John to sign the Magna Carta at Runnymede, Bishop Hugh of Lincoln was there and he brought an original copy back to Lincoln. It is one of only four original copies of the Magna Carta, the foundational document of the American legal system, in the world. Two years later, in 1217, a new document was drawn up, incorporating most of the original and adding improvements. It is known as the Charter of the Forest and the underground Magna Carta Vault at Lincoln Castle is the only place you can see both, side by side. There's also a wrap-around screen with a 3D film putting the documents in context and explaining why the Magna Carta, which establishes the rights of the people and the principle that no one is above the law, is important today. The Medieval Wall Walk: Circumnavigate the Castle on its intact curtain walls, stopping to peek into the towers and dungeons along the way. Recent improvements have made it accessible — with a wheelchair lift to take visitors up to the safe and dramatic third of a mile wall walk. Lincoln isn't on the coast but it has a waterfront — and a very old one at that. 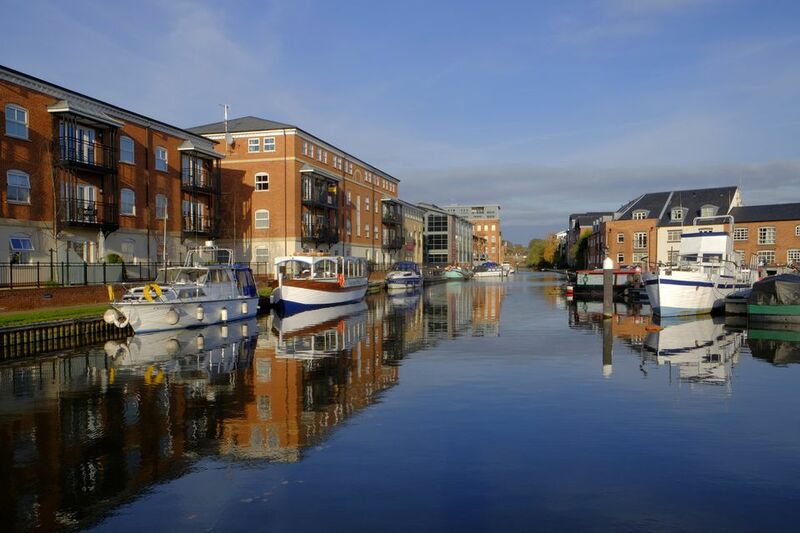 The Brayford Pool marks the meeting point of the River Witham with the canal known as the Fossdyke Navigation. The Fossdyke connects the Witham to the River Trent — one of England's major waterways. It's the oldest canal in the UK with origins lost in the murky, unrecorded history of the Dark Ages. But the best guess is that the Romans built it around 120 A.D.
You can walk or cycle on 6 mile-long Fossdyke Canal Trail, but why not take to the water instead. The canal itself offers 10 miles of calm, lock free paddling waters, perfect for leisurely canoe or kayak outings. The Major Oak, is between 800 and 1,000 years old. Legend has it that this was Robin Hood's hiding place and the shelter where he and his band of Merry Men slept, hidden from sight and the evil Sheriff of Nottingham. At the Sherwood Forest Visitor Center you can find out the best ways to explore this ancient woodland. There's information about walks, wildlife and legends to explore. An important feature of this forest is the number of truly ancient oak trees here. There are at least 1,000 that are thought to be at least 500 years old.